One more idea for the Valentine’s Day. Easy-to-make, always fresh, but sweet blossoms. Very versatile gift for somebody, you want to give a little sweet and joy. 5 chupa-chups or something similar on a plastic handle. Using a printed pattern, cut out two flower shapes from red paper and 3 flower shapes out of pink. With gold and silver markers outline the petal edges. 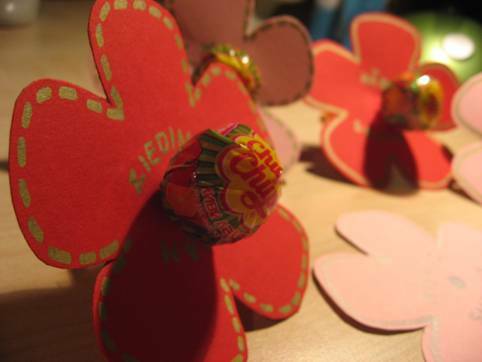 On each blossom you can also write a some special wish or just loving words. For example, "from flower to flower", "blossomed out for you", "snack and sweety", etc.. In the middle of the flower cut out a hole using awl and put a chupa-chups handle in it. Flowers are ready. How to make a soap-sponge? What do others looking for? © IINUU | Reproducing or citing link to www.iinuu.eu mandatory! where to eat in riga?